Bacon Goddess: Bacon Baby Formula. Wait. What? I love you J&D. Really, I do. I mean, you're the guys who brought us Bacon Salt and Baconnaise! But I think you might be pushing it a bit this time. Bacon Baby formula? Really? Okay, no it's not real - but it sure is funny! This is pretty old, but in case you missed it, I'm going to post about it. You know, just to tide you over while I gather my recipes for some big sportsball game going on this weekend. 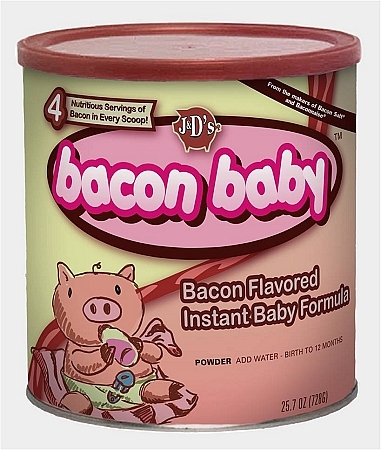 J&D cooked up a wallop of a April Fool's Day prank in 2010 with their Bacon Baby baby formula. They had a good number of folks going for awhile as well. "What's especially scary is that this could easily become the norm. In fifty years, the leaders of our country may never have lived in a world where babies were not greeted with bacon the moment they emerged from the womb." "J&D cites in their announcement post on baconsaltblog.com that this isn’t a hoax or even just another bacon-flavored product, it’s a formula to improve your baby’s quality of life, can help them excel at a young age and they say they have legitimate research to back up with." Several news sites and mommy blogs also picked up the story, but most of the articles ended up being taken down after people realized what day it was. "So we consulted with pediatricians and began to experiment with drying and grinding bacon into a fine powder, then applying a patent-pending process to concentrate this powder into the most essential nutrients and ingredients for brain development. This potential infant superfood was then added to a test subject’s infant formula. The results were absolutely impressive. By the age of 4 months, our test subject started to exhibit some amazing abilities including walking and talking. By 6 months of age, she could read and memorize her early stage children's books and showed an extreme level of coordination and balance – so much so that she was enrolled in gymnastics and ballet with children 5 years older than she was! At two years old, she read her first 300 page book, memorized the Declaration of Independence and (this is absolutely true) began composing her first symphony." Definitely one of the most fabulous pranks ever. Love it! The best thing? The product is still up on their store!